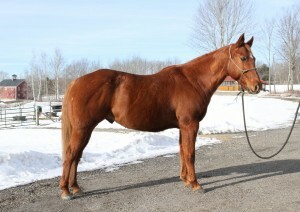 Roman is a 9 year old, 15.2hh, chestnut Quarter Horse gelding rescued from a Pennsylvania kill pen. He came in along with Tommy from Whispering Woods Farm in Maryland in October 2015. It is believed that Roman may have been used as a lead-line pony because he has good ground manners and stands nicely for grooming, saddling and mounting. It seems as though Roman was never asked to move forward by his rider and knew no leg or verbal cues. 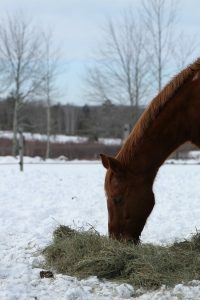 He was sent to a professional trainer and learned to walk/trot/canter, but upon returning to Whispering Woods, he was not able to follow through with transitions. Horses with Hope adopted Roman and now is able to provide the continued training that Roman will need to overcome his limitations. He has an old (rope or wire?) scar on his left rear hock. After examinations and several x-rays, our veterinarians indicated this should not affect his movement. He is excellent on trails, and really seems to enjoy it by himself or with others. We are looking forward to finding the perfect home for Roman. Update: InJune 2016, Roman moved to a new stable just around the corner from us in Pittstown, Maine. He has made great strides since coming to us in October 2015, and we discovered Roman’s story along the way. Apparently, Roman’s owner passed away and his children didn’t know what to do with the horses. So they took them to an auction. It was there that the kill buyer purchased Roman. Through wonderful efforts of Kris Young, he was sprung from the kill buyers and went to Whispering Woods Rescue in Maryland. At first during his training process, Roman was very distant. Part of the rehabilitation process is providing the physical support to allow the emotional break through to happen. Roman came out of his shell and began engaging in his training . Then we met Abby. 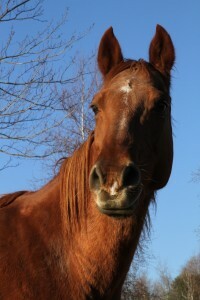 She has followed Horses with Hope for some time and immediately fell in love with Roman. She met him at the open house and he was as crazy about her as she was smitten with him. Abby came out to ride Roman and that pretty much sealed the deal! Abby and Roman are going to continue his training together and plan to enjoy many miles of trails. If Roman could write a book, what an adventure it would be. We hope Abby and Roman enjoy the best of times with each other. Congratulations to both Roman and his wonderful new forever family.